Something I’ve been meaning to buy and read for a while. The Mnemonic Major System and Gregg Shorthand Have the Same Underlying Structure! I’ve been a proponent and user of a variety of mnemonic systems since I was about eleven years old. The two biggest and most useful in my mind are commonly known as the “method of loci” and the “major system.” The major system is also variously known as the phonetic number system, the phonetic mnemonic system, or Hergione’s mnemonic system after French mathematician and astronomer Pierre Hérigone (1580-1643) who is thought to have originated its use. The major system generally works by converting numbers into consonant sounds and then from there into words by adding vowels under the overarching principle that images (of the words) can be remembered more easily than the numbers themselves. For instance, one could memorize one’s grocery list of a hundred items by associating each shopping item on a numbered list with the word associated with the individual number in the list. As an example, if item 22 on the list is lemons, one could translate the number 22 as “nun” within the major system and then associate or picture a nun with lemons – perhaps a nun in full habit taking a bath in lemons to make the image stick in one’s memory better. Then at the grocery store, when going down one’s list, when arriving at number 22 on the list, one automatically translates the number 22 to “nun” which will almost immediately conjure the image of a nun taking a bath in lemons which gives one the item on the list that needed to be remembered. This comes in handy particularly when one needs to be able to remember large lists of items in and out of order. There are a variety of ways to use the major system as a code in addition to its uses in mnemonic settings. When I was a youth, I used it to write coded messages and to encrypt a variety of things for personal use. After I had originally read Dr. Bruno Furst’s series of booklets entitled You Can Remember: A Home Study Course in Memory and Concentration 1, I had always wanted to spend some time creating an alternate method of writing using the method. Sadly I never made the time to do the project, but yesterday I made a very interesting discovery that, to my knowledge, doesn’t seem to have been previously noticed! 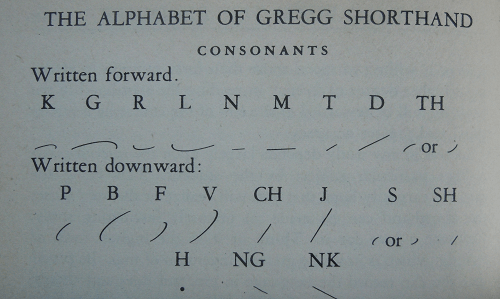 Gregg Shorthand is using EXACTLY the same consonant-type breakdown of the alphabet as the major system! Apparently I wasn’t the first to have the idea to turn the major system into a system of writing. The fact that the consonant breakdowns for the major system coincide almost directly to those for the shorthand method used by Gregg cannot be a coincidence! The Gregg system works incredibly well precisely because the major system works so well. The biggest difference between the two systems is that Gregg utilizes a series of strokes (circles and semicircles) to indicate particular vowel sounds which allows for better differentiation of words which the major system doesn’t generally take into consideration. From an information theoretic standpoint, this is almost required to make the coding from one alphabet to the other possible, but much like ancient Hebrew, leaving out the vowels doesn’t remove that much information. Gregg, also like Hebrew, also uses dots and dashes above or below certain letters to indicate the precise sound of many of its vowels. The upside of all of this is that the major system is incredibly easy to learn and use, and from here, learning Gregg shorthand is just a hop, skip , and a jump – heck, it’s really only just a hop because the underlying structure is so similar. Naturally as with the major system, one must commit some time to practicing it to improve on speed and accuracy, but the general learning of the system is incredibly straightforward. 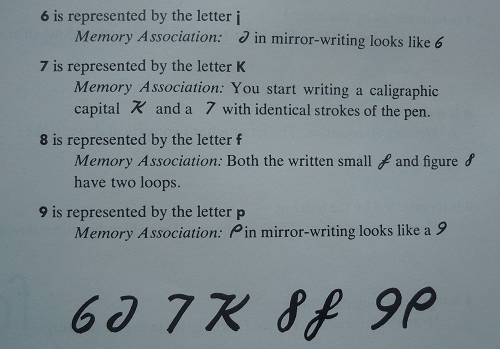 Because the associations between the two systems are so similar, I wasn’t too surprised to find that some of the descriptions of why certain strokes were used for certain letters were very similar to the mnemonics for why certain letters were used for certain numbers in the major system. The mnemonic for remembering 6, 7, 8, & 9 in the major system. The mnemonic for remembering the strokes for k and g.
One thing I have noticed in my studies on these topics is the occasional references to the letter combinations “NG” and “NK”. I’m curious why these are singled out in some of these systems? I have a strong suspicion that their inclusion/exclusion in various incarnations of their respective systems may be helpful in dating the evolution of these systems over time. I’m aware that various versions of shorthand have appeared over the centuries with the first recorded having been the “Tironian Notes” of Marcus Tullius Tiro (103-4 BCE) who apparently used his system to write down the speeches of his master Cicero. I’m now much more curious at what point the concepts for shorthand and the major system crossed paths or converged? My assumption would be that it happened in the late Renaissance, but it would be nice to have the underlying references and support for such a timeline. Perhaps it was with Timothy Bright’s publication of Characterie; An Arte of Shorte, Swifte and Secrete Writing by Character (1588) 4, John Willis’s Art of Stenography (1602) 5, Edmond Willis’s An abbreviation of writing by character (1618) 6, or Thomas Shelton’s Short Writing (1626) 7? Shelton’s system was certainly very popular and well know because it was used by both Samuel Pepys and Sir Isaac Newton. Certainly some in-depth research will tell, though if anyone has ideas, please don’t hesitate to indicate your ideas in the comments. I’m adding a new chart making the correspondence between the major system and Gregg Shorthand more explicit. the major system and Gregg Shorthand. Furst B. You Can Remember: A Home Study Course in Memory and Concentration. Markus-Campbell Co.; 1965. Hollier D. How to Write 225 Words Per Minute With a Pen: A lesson in the lost technology of shorthand. The Atlantic. http://www.theatlantic.com/technology/archive/2014/06/yeah-i-still-use-shorthand-and-a-smartpen/373281/. Published 2014. Leslie LA. Gregg Shorthand: Functional Method. Gregg Publishing Company; 1947. Bright T (1550-1615). Characterie; An Arte of Shorte, Swifte and Secrete Writing by Character. 1st ed. I. Windet; reprinted by W. Holmes, Ulverstone; 1588. https://archive.org/details/characteriearteo00brig. Willis J. Art of Stenography. ; 1602. Willis E. An Abbreviation of Writing by Character. ; 1618. Shelton T. Short Writing. ; 1626. Early in the series there were some interesting and important re-definitions of some contemporary words. Cary pushes them back to an earlier time with slightly different meanings compared to their modern ones which certainly helps to frame the overarching philosophy presented. Without a close study of this vocabulary, many modern readers will become lost or certainly misdirected when reading modern translations. As examples, words like perverse, righteousness, and justice (or more specifically their Latin counterparts) have subtly different meanings in the late Roman empire than they do today, even in modern day religious settings. My favorite part, however, has to have been the examples discussing mathematics as an extended metaphor for God and divinity to help to clarify some of Augustine’s thought. These were not only very useful, but very entertaining to me. Those interested in memes and the history of “memoria ex locis” (of which I don’t even find a reference explicitly written in the original Rhetorica ad Herrenium) would appreciate an additional reference I subsequently found in the opening (and somewhat poetic) paragraph of a paper written by David Tell on JSTOR. The earliest specific reference to a “memory palace” I’m aware of is Matteo Ricci’s in the 16th century, but certainly other references to the construct may have come earlier. Given that Ricci was a Jesuit priest, it’s nearly certain that he would have been familiar with Augustine’s writings at the time, and it’s possible that his modification of Augustine’s mention brought the concept into its current use. Many will know memory as one of the major underpinnings of rhetoric (of which Augustine was a diligent student) as part of the original trivium. Some may shy away from Augustine because of the religious overtones which go along with his work, but though there were occasional “preachy sounding” sections in the material, they were present only to clarify the philosophy. I’d certainly recommend this series of lectures to anyone not closely familiar with Augustine’s work as it has had a profound and continuing affect on Western philosophy, thought, and politics.